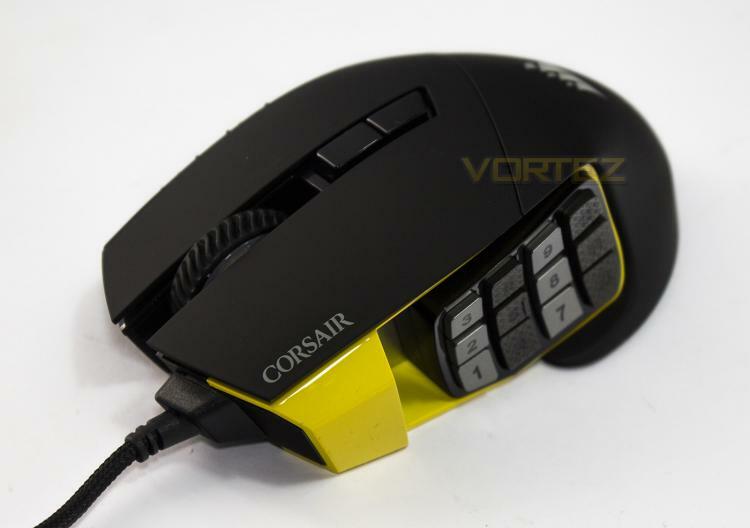 Taking the next step to improve their impressive Scimitar MMO mouse, Corsair get ultra-accurate with a new 16,000DPI optical sensor, which is something we are pleased to hear especially since our primary concern in our first outing with the Scimitar RGB was its shaky sensor performance. Returning features including the adjustable 12 mechanical side buttons that have around 8mm movement that can be positioned to suit your preference. This is especially handy to help people using various grips maximise the usability of such a large array of buttons. As it is part of Corsair's RGB lineup, it features 4 lighting zones (front, wheel, logo, buttons), and an additional customisable profile lighting indicator. You can be sure of the high quality finish and materials used by Corsair, including a metal housing for the buttons, however it has a total weight of 147g, making it on the heavier side of mice. The SCIMITAR PRO RGB gaming mouse advances your game with the customizable Key Slider™ macro button control system, a native 16000 DPI precision optical sensor, and onboard profile storage.